Packing for a road trip can be tough. I've done 2 week road trips in a sports car with a boot that roughly equates to 2 average supermarket shopping bags. More recently, I became a dad and realised how much luggage a tiny baby needs to be packed with them. No matter how big your car, even if you're driving a full size SUV, once you've packed all your belongings, prams, travel cot, tent and a load of other stuff, room tends to be tight and you quickly begin compromising on passenger space and visibility out of your rear view mirror. Over time I've learned to be smart with my packing and that piling bags on top of bags on the rear seat is not a good idea - especially when you are on a road trip with a lot of stops and have to get your stuff in and out of the car easily. With space inside the car at a premium on a road trip, the two things that can really help with your packing are installing a cargo box on the roof and using packing cubes. To install a cargo box, you'll need to fix rails onto the car roof - this is a fairly easy procedure for most cars. Once the rails are up, most modern cargo boxes will be compatible - check your particular car will work before buying! Packing cubes make road trips a super easy and relaxing experience. Every time your stop on your way, there's no need to get heavy suitcases in and out of your hotel room and everything you need is super easy to find. The best cargo box you can get today is the Thule Motion XT XL (available on Amazon). This cargo box is on the large side packing a whopping 500L of extra luggage - that's 40% more than the entire boot of a Toyota Corolla! The XL model has fixings that are set further back on the box than the smaller M or L models. This means that when fitted to your roof rails, the box does not overhang at the back so even if you have a hatchback, you should be able to open the boot without touching the box. If you compare it to the smallest M model, you get an extra 100L of storage space for the 40cm difference in length and the price is only about 10% more. There are better looking cargo boxes such as the Thule Alpine which is more aerodynamic but also more expensive. This box is 17cm shorter than the Alpine, but carries 50L more and can still fit skis up to 200cm which is long enough for most people. One great feature of these boxes is the Power Click locking system which makes it very easy to know your box is firmly locked onto your roof. 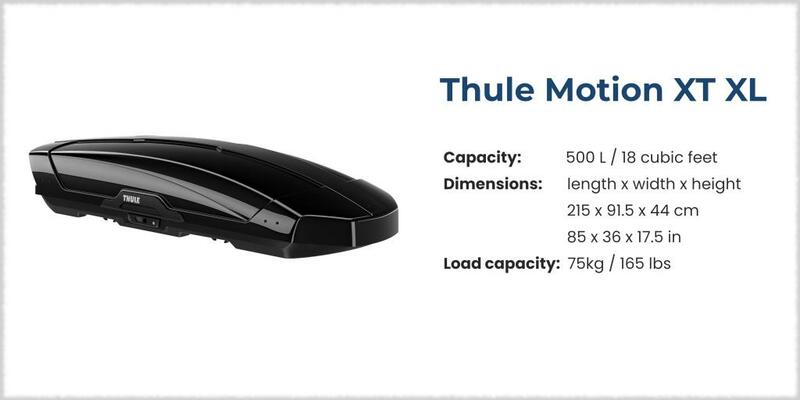 There are two or three colours available depending on where you're buying the Thule Motion XT XL - a black and a grey one are available in most places but there is also a limited edition white option. Check out what colours are available on Amazon. Make sure that when you're choosing your rooftop cargo box, you don't try and save money by buying one of the soft bag-style options. These can be really frustrating to fix to your rails, are much harder to get stuff in and out of and if you're planning on driving down a motorway on a windy day, you won't like the noise those make! I know what you're thinking - how exciting can some packing cubes be and who uses them anyway? Truth is - there are few things that come in as useful as these on a long road trip. One of the most annoying things when you're driving between places and stopping somewhere for a night at the end of the day is having to lug your whole bag/suitcase out of the car, up flights of stairs, through doors and into your room only to spend 10 minutes trying to find the right change of clothes and toiletries that have moved around. Packing cubes transform the way you pack for road trips. Keep one cube full of your toiletries and bathroom essentials and pack the rest of the clothes into cubes - 1 day per bag. 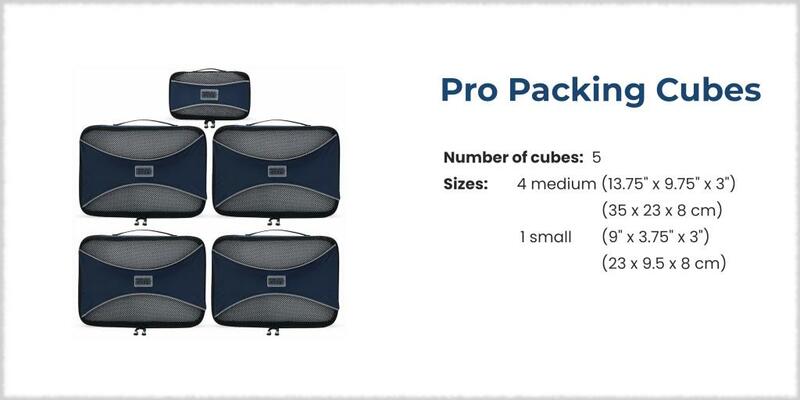 These sets of PRO packing cubes (available on Amazon) are ideal for a couple to fit 1 day's worth of clothes into the medium sized cubes, toiletries, flip flops and chargers into the small ones. If you're going on a longer trip, get a couple of sets - it'll be worth it and it's still a lot cheaper than buying a suitcase. When you get to your hotel, grab a fresh cube and your toiletries bag and go relax in your room. Might feel a little weird without having huge amounts of luggage, but it really does make for a relaxing way to do travel. A top tip is not to pack these into a suitcase, but line them up vertically in your boot (use stickers if you want to mark the days!). You can then just get the right one out without having to search through your luggage. As an Amazon Associate, LazyTrips earns commission from qualifying purchases.